It's been thirteen years since Lucy Sheridan was in Summer River. The last time she visited her aunt Sara there, as a teenager, she'd been sent home suddenly after being dragged out of a wild party - by the guy she had a crush on, just to make it more embarrassing. Obviously Mason Fletcher - only a few years older but somehow a lot more of a grown-up - was the overprotective type who thought he had to come to her rescue. Now, returning after her aunt' s fatal car accident, Lucy is learning there was more to the story than she realized at the time. Mason had saved her from a very nasty crime that night - and soon afterward, Tristan, the cold-blooded rich kid who'd targeted her, disappeared mysteriously, his body never found. A lot has changed in thirteen years. Lucy now works for a private investigation firm as a forensic genealogist, while Mason has quit the police force to run a successful security firm with his brother - though he still knows his way around a wrench when he fills in at his uncle' s local hardware store. Even Summer River has changed, from a sleepy farm town into a trendy upscale spot in California' s wine country. But Mason is still a protector at heart, a serious (and seriously attractive) man. And when he and Lucy make a shocking discovery inside Sara' s house, and some of Tristan' s old friends start acting suspicious, Mason' s quietly fierce instincts kick into gear. He saved Lucy once, and he' ll save her again. But this time, she insists on playing a role in her own rescue. 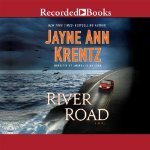 I have had River Road sitting on my iPod for awhile now, I was put off by a few reviews on Audible about the narrator. Eventually I decided to listen to it .... and was pleasantly surprised. The narrator was not awful and I enjoyed her reading of River Road. Amanda Lee Cob was good and although her voice variation of characters was not great, everything else satisfied me. I like romantic suspense written by this author - Falling Awake I think is my favourite. Lucy is a strong heroine, she has returned to town to tidy up the estate of her aunt. While doing so she meets up again with Mason. Previously when Lucy had stayed in town when she was younger, Mason had kept an eye out for her and saved her from a bad experience. Although to say Lucy was grateful would be stretching it. Mason is a wonderful hero and the friendship that rekindles into a more intimate relationship moves forward slowly but surely. There is a heap of mystery in the story and as Lucy sorts out her Aunt Sara's house she and Mason make a grisly discovery. Drugs, money, jealousy, and murder are soon weaving the twists and turns of events that follow. Lucy is in danger yet she keeps her head and Mason provides needed back up. As the story unfolds I didn't guess the present day murderer until revealed. I rarely do though! Very much worth my credit at Audible! This sound like an enjoyable romantic suspense. I like a male character who comes to the rescue. I'm glad Lucy played a part the second time around. Yes Pat a good romantic suspense indeed.